Hate boring plain coffee cups with a canteen-like feel? 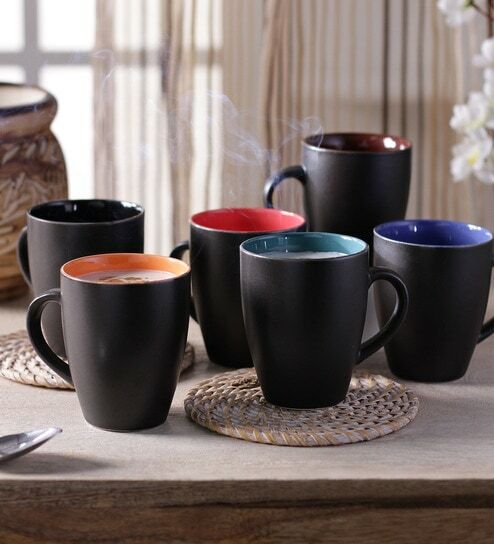 Spice things up with the CdiBlack Matt Finish Coffee Mugs - Set of 6, a rare treat for all those who love bright colours! Enjoy a cup full of great tasting tea or coffee with this cool set with funky designs and start your day on a great note! This set is great for everyday use and is also heat-resistant as well as fade resistant. Each cup features a large grip handle, steady base and 250ml capacity. Use it in the microwave and dishwasher without any fear of ruining the funky colour! Choose yourfavouritetea cup or coffee mug designs from a wide range of happy and delightful illustrations fromCdi. Disclaimer: This is a handmade creation,consequences of which is that no two items are ever exactly the same.Every Product is a exclusive creation. Subsequently as these stoneware/ceramic are crafted by hand there may be certain design variations,subtle,slight colour difference or small minor pinholes may occur. Also there may be slight variations between the reffered image on the website and the actual product.